Google Instant Makes Search Engine Optimisation Useless? Google Instant has already made a lot of waves among the user community. While everyone is pretty excited with this all new search feature from Google, but will this new search platform, Google Insight affect search queries and organic traffic to websites? Steve Rubel (bio) SVP, Director of Insights for Edelman Digital shares his thoughts. According to Steve, this means that no two people will see the same web with Google Instant. As, a single search would do the trick and everyone saw the same results. That's what made search engine optimization work. Now, with this, everyone is going to start tweaking their searches in real-time. The reason this is a game changer is feedback. When you get feedback, you change your behaviors. 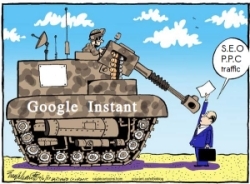 Google Instant means no one will see the same web anymore, making optimizing it virtually impossible. Real-time feedback will change and personalize people's search behaviors. Google has already indicated about possible traffic fluctuations around organic keywords.